0–2 No danger to the average person Wear sunglasses on bright days; use sunscreen if there is snow on the ground, which reflects UV radiation, or if you have particularly fair skin. 3–5 Little risk of harm from unprotected sun exposure Wear sunglasses and use sunscreen, cover the body with clothing and a hat, and seek shade around midday when the sun is most intense. 6–7 High risk of harm from unprotected sun exposure Wear sunglasses and use sunscreen having a sun protection factor of 15 or higher, cover the body with sun protective clothing and a wide-brim hat, and reduce time in the sun from two hours before to three hours after solar noon (roughly 10:00 AM to 4:00 PM during summer in zones that observe daylight saving time. 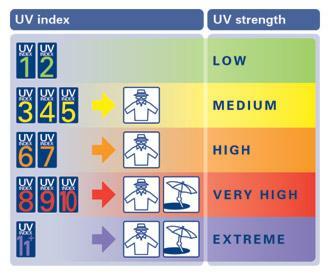 8–10 Very high risk of harm from unprotected sun exposure Wear sunscreen, a shirt, sunglasses, and a hat. Do not stay out in the sun for too long. 11+ Extreme risk of harm from unprotected sun exposure Take all precautions, including: wear sunglasses and use sunscreen, cover the body with a long-sleeve shirt and pants>, wear a very broad hat, and avoid the sun from two hours before to three hours after solar noon.